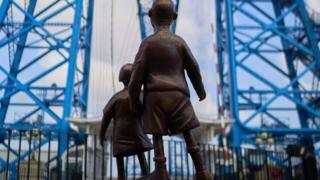 A bronze sculpture celebrating the industrial history of Teesside has been installed next to Middlesbrough's Transporter Bridge. The artwork by Mackenzie Thorpe, who was born in the town and once worked in a local shipyard, is based on his painting Waiting for Me Dad. He described the figures of a young boy and girl as a "nostalgic look back at childhood memories". It will be on loan for two years to mark his 30th year as an artist. The sculpture was unveiled at a ceremony involving civic dignitaries and a male choir. Mr Thorpe said that growing up in Middlesbrough "that sense of industry" seemed to be everywhere. He said: "I wanted to acknowledge that time, when it was normal for droves of men to cross the river daily to work long hard shifts and families waited for their return. "The piece is an acknowledgement of that time, of the industry and the men and their families who helped shape our town."